13 km from the campsite (20 mins) – pebble beach – free car park – on-site restaurant – shower/toilets – exposed to westerly winds. Comprising sand and small stones, Almanarre beach in Hyères is a delight in all seasons and a hotspot for kitesurfers, funboarders, etc. It is set on one of the sandy arms running from the mainland to Giens Peninsula (the western arm), at the edge of the old salt road (Route du Sel). The water is shallow at the Giens end which is popular with families. The other end offers ideal depths for windsurfers. Parking is free but parking spaces are limited in comparison to the size of the beach. 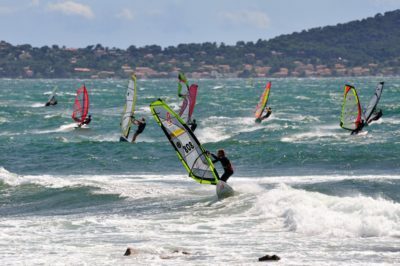 Highly exposed to westerly winds – but coveted by windsurfers and kitesurfers!